Measuring 5" x 6" x 6 1/2" this Budget Brain Model is a budget form of a brain archetype that replicates and practically demonstrate multiple views of a human brain. Its has colored markings that illustrate both arteries and cranial nerves; allowing you to easily identify each brain structure. The arteries are can be identified with a red colored marking while the cranial nerves are colored with yellow markings. 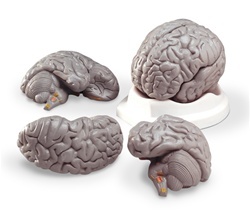 This budget brain model is very educational wherein it can also be divided into 3 parts allowing you to have a closer and more comprehensive study of each brain structure; perfect for a hands-on study of the brain anatomy. It sits on a sturdy base which is beneficial for having a more comfortable and steady presentation. And because of the nature of this budget model, it is the best use and suitable for basic anatomical study. It is highly recommended to both high school and general undergraduate anatomy classes. ECONOMY-This budget brain model is very reasonable and perfect for a basic anatomical study. It is highly recommended to both high school and general undergraduate anatomy class. FUNCTIONAL-This budget brain model is can be dissected into 3 parts and featured with colored markings that illustrate both arteries and cranial nerves allowing you to easily identify and further understand each brain structure. COMES WITH A STURDY BASE- Allowing you to have a more comfortable and steady presentation. MEASUREMENT – It measures 5" x 6" x 6-1/2", great for demonstrating to a large group. I expected a fairly robust plastic or resin, but the brain model I received was fairly clearly some kind of plaster.